Now that I'm researching this I see it happened a while ago, but it's still a good reason. The incident took place in August 2011, at the Star Buffet in East Lampeter Township, Pennsylvania. The 48-year-old victim later testified that after waiting in the buffet line, he did in fact take the last eight crab legs then present. "I cleaned it out," he admitted. This did not sit well with a woman behind him in line, who called him a "pig" and made references to his weight. The victim said he ignored her comments and sat down to eat. 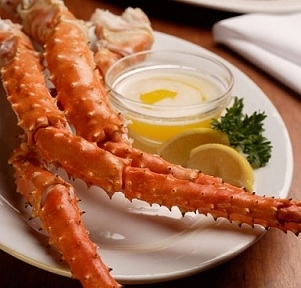 Not long after, the woman's 21-year-old companion (hereinafter "the defendant") came over to the table and demanded redress, because nothing is more insulting to one's manhood than to have another man temporarily deprive one's female companion of a few crab legs that she was not entitled to in the first place. The victim testified that the defendant called him "big man" and, using profanities, demanded to know why he had taken all the crab legs. "He was like a raging maniac," the victim testified. "I'm looking [at him] in disbelief." He said the defendant "charged him" and that he responded by grabbing the man's arms and trying to restrain him. The defendant freed himself, punched the victim in the face and then tackled him, injuring his ribs as they crashed to the floor. More face-punching followed. The defendant claimed that the victim hit him first, but an eyewitness contradicted this and the jury didn't believe it (hence my use of the word "victim"). The jury apparently did find "mutual consent" to fight existed because the victim put his hands on the defendant, and under Pennsylvania law this reduces an assault charge from a second- to third-degree misdemeanor. The judge later sentenced the defendant to several months of house arrest and a year of probation. At the sentencing hearing (see "Crab legs assailant sentenced," LancasterOnline.com (May 18, 2012)), the defendant said he had "learned [his] lesson" and in the future would just take his plate—"crabs or not"—and sit down. But the judge decided to drive the point home with a lecture on the moral implications of his conduct. Respect, the judge told the young man, "is not earned by the use of your fists. It's earned by waiting, patiently, for the next batch of crab legs." Yes, that is so true, isn't it? I still remember my dad giving me the "wait for the crab legs" speech when I was a boy, and it made a real impression on me. I guess not everyone is so lucky. "The fact that [the victim] was perfectly free to take as many crab legs as he wanted made no difference to you," the judge thundered. "You decided you were the one who had the moral authority to decide what was right." Okay, you know what? It's not the Nuremburg trials here. He punched a guy over some crab legs. Slap a bracelet on his ankle, make him pay restitution, and let's move on to the next third-degree misdemeanor.